The Bible has a list of unforgettable walks... The first one was taken by God Himself as the Bible tells us that God walked in the Garden of Eden in the cool of the day but as a general rule God asked people to walk with Him! The Hard walk that Abraham has to do when he took his son Isaac to Mount Moriah. Then there was the walk that Moses did as he led the Israelites through the Red Sea and the frustrating walk they took through the wilderness for 40 years. There was Joshua’s triumphant walk around Jericho, the disciples illuminating walk to Emmaus and Paul’s interrupted walk to Damascus. There was the walk so sad and Holy its name, “the way of great sorrow” when our Lord walked the road to Golgotha – called the Via Dolorosa! First we have to understand – what is special about the Sea of Galilee… Many of Yeshua’ (Jesus) sermons were preached on the shores of the lake at a time when there was a string of villages around the water's edge. In the time of the Byzantine Empire the lake’s significance in Yeshua’s life made it a major destination for believers. Its importance declined when the Byzantines lost control and the area came under the control of the Islamic Umayyad Caliphate. At this time all of the major cities in the area, other than Tiberias, were abandoned. In 1187, Saladin defeated the armies of the Crusades at the Battle of Hattin, largely because he was able to cut the Crusaders off from the valuable “sweet” fresh water of the Sea of Galilee. The Sea of Galilee is sheltered by the surrounding hills and plateaus, affording a mild winter …but summers are quite hot and the month of August at times, unbearably hot. Most precipitation occurs during the area's short winters, in the form of brief but powerful showers. Due to its low-lying position in the Rift Valley, surrounded by hills, the sea is prone to sudden violent storms. Indeed, the main feature of the lake seems to be its ever-changing character. It is bounded by hills, especially on the east side where they reach 2000 feet high. Such storms result from differences in temperatures between the seacoast and the mountains beyond. These heights are a source of cool, dry air. In contrast, directly around the sea, the climate is semi-tropical with warm, moist air. The large difference in height between surrounding land and the sea causes large temperature and pressure changes. This results in strong winds dropping to the sea, funnelling through the hills. The Sea of Galilee is small, and these winds may descend directly to the centre of the lake with violent results. When the contrasting air masses meet, a storm can arise quickly and without warning. Small boats caught out on the sea are in immediate danger. The Sea of Galilee is relatively shallow, just 200 feet at its greatest depth. A shallow lake is “whipped up” by wind more rapidly than deep water, where energy is more readily absorbed. Luke 8 describes the wind and raging waves during this storm and Matthew calls it a furious storm without warning! The Sea of Galilee (Kinneret) lies on the ancient Via Maris which linked Egypt with the Northern Empires. The Greeks, Hasmoneans and Romans founded flourishing towns and settlements here: Gadara, Hippos, Tiberias, and others. At 209 meters below sea level, it has long been thought to be the lowest freshwater lake on Earth and the second-lowest lake in the world after the Dead Sea, a saltwater lake. The Sea of Galilee is fed by underground springs, but its main source is the Jordan River, which flows through it from north to the south. The lake is situated deep in the Jordan Great Rift Valley (the Great Rift Valley is such a significant physical feature on the earth that it is clearly visible from space! ), the valley was caused by the separation of the African and Arabian Plates and so consequently, the area is subject to earthquakes and, in the past, volcanic activity. This is evidenced by the abundant basalt and other igneous rock that defines the geology of the Sea of Galilee region. It is Israel's major water reservoir. Through the National Water Carrier of Israel’s system, water is supplied to the country's urban centres as well as to the Negev Desert in the south. The name may originate from the Hebrew word; “kinnor” which means “harp” or “lyre” in view of the shape of the lake. The New Testament call it “Lake of Gennesaret” or “Sea of Gennesaret” (Luke 5:1), after a small fertile plain that lies on its western side. Other names for the Sea of Galilee are; “Ginnosar,” “Lake of Gennesar,” “Sea of Chinneroth,” and “Sea of Tiberias” (Roman). The first Century Jewish historian Flavius Josephus was so impressed by the area that he wrote, “One may call this place the ambition of Nature.” Josephus also reported a thriving fishing industry at the time, with 230 boats regularly working in the lake. He wrote of nine Ancient Cities on the lake's shores, of which only Tiberias has survived. This city, on the lake's western shore was one of four Holy Cities. Kefar Nahum (Capernaum) – the City of Yeshua - Jesus, has preserved one of the most beautiful synagogues in the region, dating from the second and third centuries BC. Much of the ministry of Yeshua (Jesus) occurred on the shores of the Sea of Galilee. In those days, there was a continuous ribbon development of settlements and villages around the lake and plenty of trade and ferrying by boat. In the Synoptic Gospels; Mark 1:14-20, Matthew 4:18-22 and Luke 5:1-11 …Yeshua recruited four of His Apostles from the shores of Lake Galilee. The fishermen Simon and his brother Andrew and the brothers John and James. 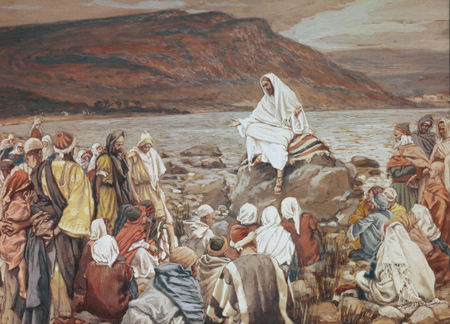 One of Yeshua' famous teaching episodes, “The Sermon on the Mount,” was given on a hill overlooking the lake. Many of His miracles were also recorded to occur here… His walking on water, calming a storm, feeding the multitude (in Tabgha), and many others. Peter’s unforgettable walk on the water stands out to all of us and is an invitation to step out in faith and experience something more of the power and presence of God… Peter and his friends got into a little boat one afternoon to cross the Sea of Galilee. Yeshua (Jesus) wanted to be alone so they were boating without Him. Peter didn’t mind – he had been on boats his whole life and he liked them. But, a storm blew in …and not just a storm nor a minor quall! The Gospel of Matthew says the boat was “tormented” by the waves and it was so violent that the only thing the disciples could do was to keep the boat upright. Just picture yourself in the boat with them! They wished the sides were higher and the wood a little thicker. By 3:00am we would imagine the disciples weren’t worried about making it to “the other side” as they just wanted to stay alive. 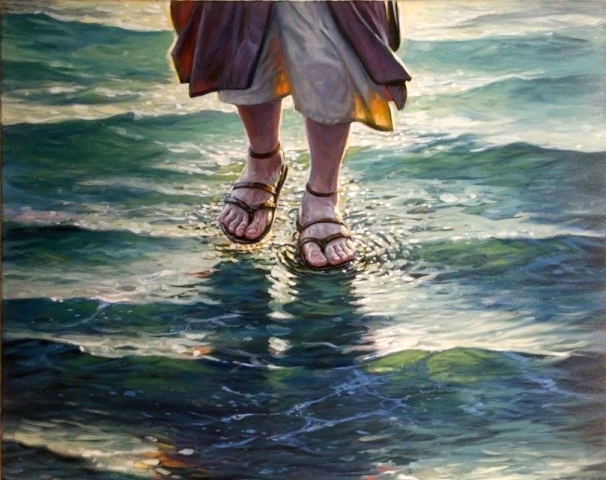 Then one of the disciples noticed “a shadow” moving toward them on the water and as it grew closer it became apparent that it was the figure of a human being – walking on the water! Just take a moment to let it sink in! 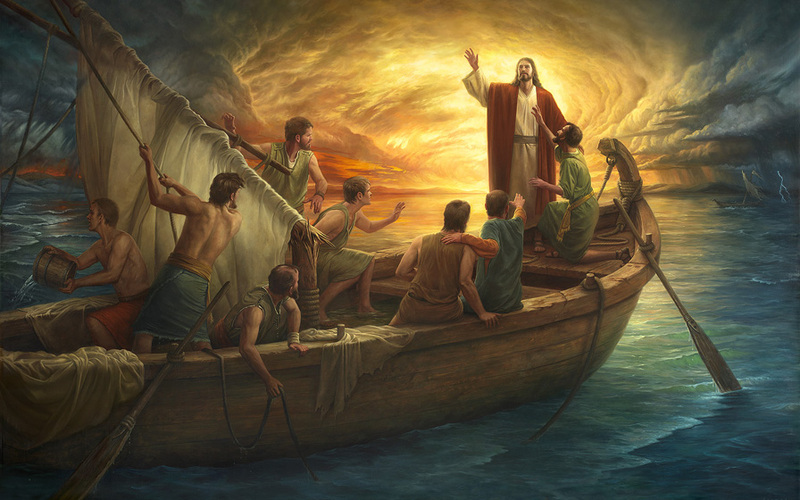 The disciples were in distress and the very person who was able to help them was approaching them - only He wasn’t in the boat and the disciples didn’t recognize Him! Amazingly enough, being boat-less didn’t seem to slow Yeshua down at all. The disciples were convinced that He was “a ghost,” so they were terrified and cried out in fear. Here we ask ourselves the questions… why didn’t they recognize the Lord…? Who else could it be…? 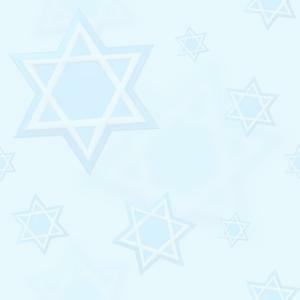 But, we have to ask again… why didn’t they recognize Yeshua (Jesus)…? The answer is they were not looking for Him! Had they been waiting by faith, they would have known Him instantly. Instead, they jumped to the false conclusion that His appearance was that of a ghost. Fear and faith cannot live in the same heart, for fear frequently blinds the eyes to the presence of the Lord! We need to know that sometimes it takes the eyes of “faith” to recognize His presence especially in the midst of a storm, tormented by waves of disappointment and doubt we are no better than the disciples! The "Fourth watch" is a time of importance…! The Romans divided the time of day into four "watches:"
The "First Watch" - from 6:00PM in the evening to 9:00PM at night. The "Second Watch"- from 9:00PM to 12:00PM (midnight). The "Third Watch" - from 12:00PM (midnight) to 03:00AM. The "Fourth Watch" - from 03:00AM in the morning to 06:00AM. In Scripture, Christ said His Second Coming could be during any of these watches and so we are to remain alert. "Blessed are those servants whom the Master, when He comes, will find watching... And if he should come in the second watch, or come in the third watch, and find them so, blessed are those servants," Luke 12:37-40. Might it be during the "third watch" …? Meantime, it was during the "fourth watch" -- which starts at 03:00AM -- that Yeshua (Jesus) walked on water to His disciples! A Rabbi once said something very interesting and has stuck with us; "A strong Jewish tradition states that several hours before the sun rises, God restrains the presence of evil and visits the earth with His Divine Presence. The timeframe begins about 03:00AM in the morning and continues until just before sunrise." So don’t be surprised when you wake at 03:00AM – just say like Samuel, "Is that you Lord?" Those divine appointed moments will come to us all and the Lord is still asking His followers to do extraordinary things …and if we are not "watching" nor "looking" for Him – we may just miss Him! There were twelve disciples in the boat and we don’t know how eleven of them responded on the boat - BUT we do know that it was Peter who called out, “Lord is that you…?” And, we know that it was Peter who got out of the boat and walked towards the Lord on the water. We also know that when Peter took his eyes of the Lord he began to sink …and it was the Lord who stretched out His hand and saved him! When we take our eyes off of the Lord and the Word of God – we too will sink. Perhaps the other eleven were overwhelmed with confusion, wonder, disbelief and fear …or perhaps the boat was their safety, security or comfort! It was Peter that became a “water walker” and he recognized the Lord in the most unlikely place – he also recognized that it was an extraordinary opportunity for spiritual growth and an amazing new adventure as a believer. Peter blurted out, “Lord if it is You, command me to walk on the water,” Matthew 14:28. Why is this important detail included…? Think about this - why didn’t Peter just jump into the water? Simply because it wasn’t about risk taking but rather obedience and faith. Courage alone is not enough and must be accompanied by wisdom and discernment, because Peter asked for clarity; “Lord if it is you…!” Maybe in the darkness the Lord must have even smiled - because only one person out of twelve got out of the boat and Peter must have pleased our Saviour as Peter had enough “faith” to believe that he could even share in God’s adventure! Peter decided that he wanted to be part of what God was doing, he wanted to be a history maker and the only person other than the Lord to have walked on water! If you want to walk on water – you have to get out of the boat! Want to know what your boat is… your “fear” will tell you! Just ask yourself, “What is it that produces “fear” in me – especially when leaving it behind and stepping out in faith!” Peter had to step to the edge of the boat, put his legs over and into stormy water knowing that and let go! 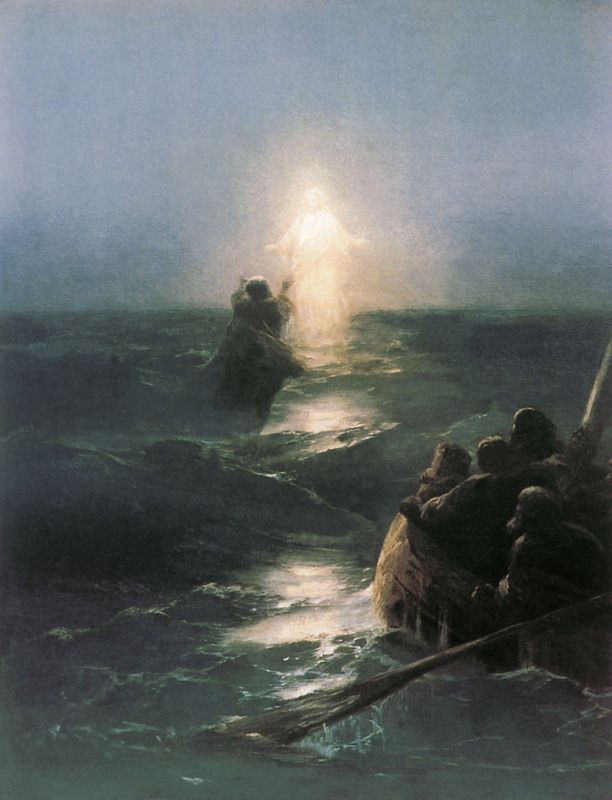 For a while it’s as if only Peter and Yeshua (Jesus) are present on the water. Peter must have been beaming and the Lord must have been pleased with him too. Like Master – like disciple. But then it happens and Peter sees the wind and it must have gripped him thinking … “what am I doing on the water - what must I have been thinking – what will the rest of the disciples say….? He would have realized that he was on the water in the middle of the storm - with no boat beneath his feet and he was terrified! Yes, what had happened was that Peter’s focus shifted to the storm and away from the Saviour. Setback – opposition – unexpected obstacles and they all will come our way and somehow catch us by surprise. Because of this many people decide to NEVER leave the boat because when you do you will face the wind and the storm out there. Here’s something none of us want to hear... 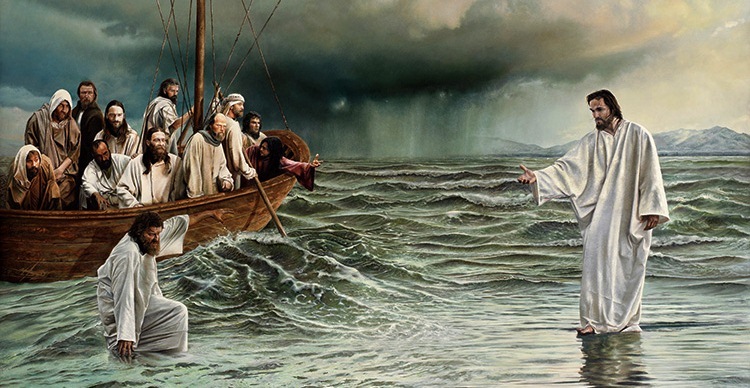 The disciples get into the boat all twelve of them, face the storm, see Yeshua walking on water, and are afraid. “Don’t be afraid,” says the Lord. Peter then girds his loins and asks permission to go overboard onto the water, sees the wind and is afraid all over again. “Don’t be afraid,” Yeshua says. It was not the last time in his life that Peter would ever experience fear again. Here’s the deep truth and it isn’t good news because fear will never go away as we continue to grow. Fear and growth – go together just like Macaroni and cheese do – it’s a package deal. The decision to grow will always involves risk and comfort – we have a choice! Each time you get out of the boat it becomes a little easier the next time. It’s then not that you don’t fear but rather that you get used to living with fear and then you realize that it does not have the power to destroy you! On the other hand, every time you resist and choose to stay on the boat the fear gets quieter and the wind no longer blows and in the end you don’t hear the Lord’s call on your life at all. Question we can ask is did Peter fail…? No! You see we refuse to “fail” or “loose” we choose to call it “learning.” We don’t lose – we learn from every experience! Peter failed whilst trying …whilst the other eleven disciples failed privately. Their failure went unnoticed, unobserved and uncriticised …and only Peter knew the shame of public failure! But only Peter knew two other things as well; he knew the glory of walking on the water and he knew what it was to attempt something that only God could actually do by empowering him and the absolute glory of God lifting him out of the water lest he drown. Interesting – that the disciples entered the boat in the first place at Yeshua’s command! They would have to learn, as we do, that obedience is no guarantee of being spared adversity. But, now as the storm had their captured attention the Lord decided it was time for them to learn who was in fact piloting this thing. He reassured them – that they could trust Him and that their safety and security was in His Hands! The Lord often comes when least expected at 03:00AM in the middle of the storm. You see the “Fourth Watch” is the last “watch” of the day …and ends just before daybreak. A New Day – A New Beginning! There are several significant points to recognize about this miracle. First, Matthew tells us that “the boat was already a considerable distance from land, buffeted by the waves because the wind was against it. During the “fourth watch” of the night Jesus went out to them, walking on the lake” (Matthew 14:24-25). Though they were only to travel a short distance, the storm was so violent that, despite all their efforts to control their boat, the storm had driven them nearly four miles (6.4 km) out into the very midst of the sea. Being the fourth watch of the night (3:00 AM to 6:00 AM), they had been rowing and straining at their oars for approaching nine hours and they were exhausted. Mark tells us that, when the disciples saw Yeshua (Jesus) walking on the lake, they thought He was “a ghost.” They cried out, because they all saw Him and were terrified (Mark 6:48-50). The second significant point of this miracle is that Yeshua always comes to us in the storms of life… This is reminiscent of the words of God to Isaiah: “When you pass through the waters, I will be with you; and when you pass through the rivers, they will not sweep over you” Isaiah 43:2. The Lord may not come at the time we think He should come, because He knows when we need Him the most. Yeshua had waited until the boat was as far from land as possible, when all their hope was gone. In essence, Yeshua was testing the disciples’ faith …and this meant removing every human crutch! We also ask ourselves why did Yeshua walk on the water…? To show His disciples that the very thing they feared, the raging, seething sea, was merely a set of steps for Him to come to them. Often we fear the difficult experiences of life such as illness, loss of loved ones, and financial hardships only to discover that these experiences can bring Yeshua (Jesus) closer to us. The Third significant point is that Yeshua (Jesus) proved Himself to be in command of the elements, something only God can do… He revealed this truth to the disciples who recognized His Divinity and responded with a confession of faith in Yeshua as God (Matthew 14:32-33). This was the first time Yeshua was called the “Son of God” by the disciples …a statement that, in fact, built on what they had said earlier about Him in Matthew 8:27. Though they had a long way to go in their spiritual understanding, the disciples were growing in their faith in the Lord. Also, this was the first time the disciples are said to have worshiped Yeshua! In Matthew 2:11, the Magi from the East worshiped Yeshua (Jesus) and later, a leper is said to have worshiped Yeshua (Matthew 8:2). And a synagogue ruler does the same thing in Matthew 9:18. But this is the first time the disciples worshiped Him. It is also important to note that their worship is joined to their confession (Matthew 14:33). You see if God can sleep through a storm He has everything under control …we need to have faith! On the same day that Yeshua (Jesus) had preached and ministered from that same boat - a place of “safety” to the multitudes in Mark 4:36-41. 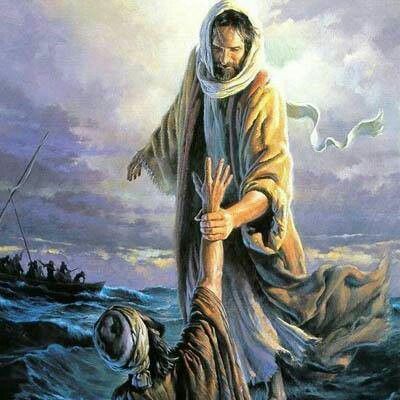 And evening had come when a furious squall came up, and the waves broke over the boat, and so that it was nearly swamped …we find Yeshua (Jesus) asleep even in the storm but the disciples were extremely afraid and after He rebuked the storm asked them, “Why are you so fearful? how is it that you have no faith? They marvelled that even the waves and the wind obeyed the Lord! Halleluyah!